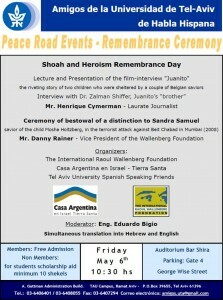 The International Raoul Wallenberg Foundation, Casa Argentina en Israel – Tierra Santa and the Spanish Speaking Friends of the Tel-Aviv University are presenting a special program on May 6, 2011 in commemoration of Yom Hashoah. The program will start with a lecture by the internationally acclaimed journalist Henrique Cymerman, and the presentation of the film-interview Juanito. 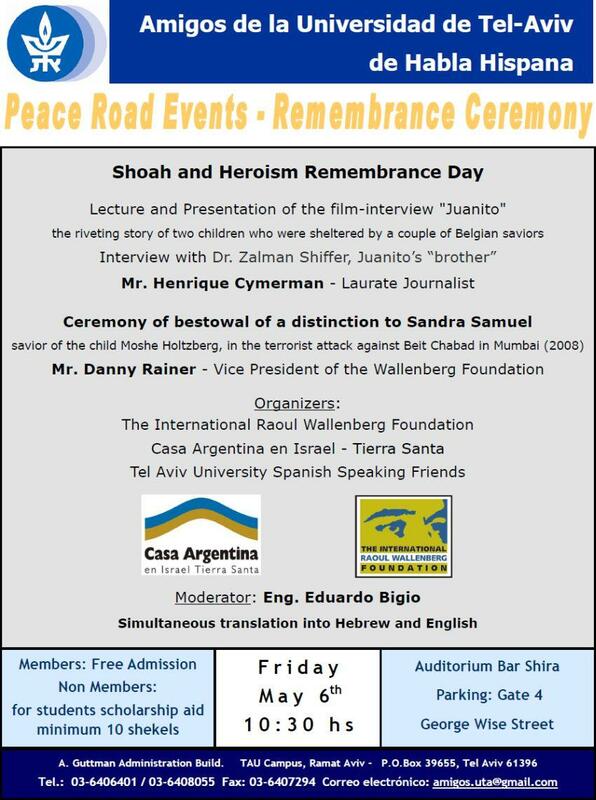 Juanito tells the remarkable story of Dr. Zalman Shiffer and his “brother” Juanito, which the IRWF has researched and documented in 2010. In 1942 in Belgium, Zalman was given shelter at the house of Louise and Joseph Materne, who had already had a Spanish boy named Juanito – who fled the Spanish Civil War – living at their house. The film-interview tells the story of these two brothers by accident, and the way this experience has changed their lives forever. After the short intermission a special Ceremony of Honoring Sandra Samuel will take place. Sandra Samuel saved the life of two-year-old Moshe Holtzberg in the terrorist attack that took place in Mumbai during the November of 2008. Sandra was working for Rabbi Gavriel Holtzberg and his wife, Rivka, at the Mumbai Chabad House since 2003, being Moshe’s nanny since his birth. On November 26, 2008, Sandra showed incredible courage rescuing Moshe while the terrorist who took the lives of his parents were still in the building. Danny Rainer, Vice President of the International Raoul Wallenberg Foundation will bestow a special distinction to Sandra Samuel.